Those are my feet in the sand! I love the feel of sand between my toes with a new pedicure. I love the bright colors of this kit and the Delusions spray... OMG... just amazing! I added a few of my favorite techniques on this page... texture, texture, TEXTURE! Using some templates, I added modeling paste from US ArtQuest (101 paste) to create a bit of raised texture and more dots. Circles are a reoccurring element on my pages. So, after spraying with the ink, i added the paste! I loved the little frames and stickers too! 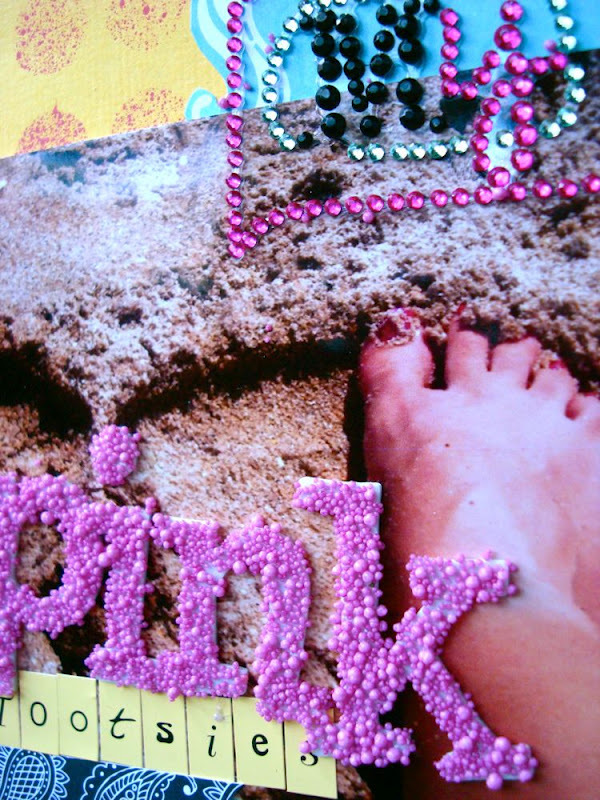 I created this page while I was on a trip to a Stamping Expo where I was demoing Faber-Castell products and was at a loss when I didn't have my stash of materials with me... so, using Gelatos, I created some drippage and bought some of these pink microbeads to add to the American Crafts Thickers. This page was a fun page to create and I wanted to express my delight every time I step onto a beach with the sand under my feet. It's pure delight and makes me feel instantly calm. 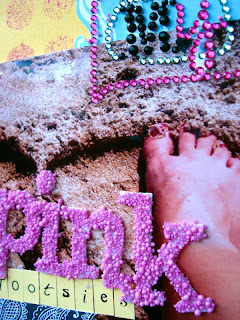 When I look at my pink toenail polish in the sand, I smile! There is nothing like a day at the beach to make you feel alive! 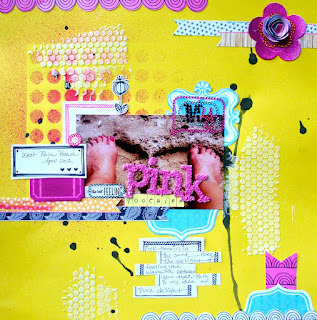 Come on over to the Scrapbooking From the Inside Out site and play with us on the challenges and don't miss out on the DT call there! This is a very generous kit and I never have any reservations when using the items in them... I actually squeal out loud when I open each month! LOVE the microbeads. What a great contrast to the grains of the sand. I always love your layouts and the artsy elements.